How to Remove Game RAR File Password? Want to play “Liberty City Stories” in your PSP, but the RAR file you downloaded has protected with password? Longing for playing “Super Mario Galaxy 2” on the Wii, yet your friend has forgotten to tell you the password of his game RAR file and you can’t wait to open the file and enjoy the game? This phenomenon often happens in our daily digital life. Then how to solve those problems? Disclaimer: The game RAR file belongs to you or you are allowed to use it, and the file was protected with password or you have forgotten the password. A RAR archive file contains multiple files compressed into one. In order to save space as well as convenient for transportation, we used to save file with RAR, especially game files for it may hold dozens of files. Making easier for game fans to download the file, publisher always pile them into RAR file. RAR file can be password-protected so that no authorized person can access the file. Sometimes, you purchase the file and get the password. Unfortunately, you are too careless to save it and forget game RAR file password. Or you get the game file from your friend, but he forgets to tell you the password. In those cases, the first thing we do is to ask the developer or friends to tell you the password. Nevertheless, not the world goes around with you, the developer or your friends couldn’t tell you the password immediately, while you are eager to enjoy the game. Then how to settle your urgent needs? There are various game RAR file password remove program and Smartkey RAR Password Recovery proved to be a nice one. It supports brute-force attack, brute force with mask and dictionary attack which can restrict the search area and shorten the game RAR password recovery time. It is thrilling to enjoy games instantly rather than waiting for your password anxiously. Related: How to use Smartkey RAR Password Recovery to remove game RAR file password? Do you always bothered by these problems? Take it easy! From now on, you will never be puzzled by these issues with Smartkey Password Recovery Bundle Enterprise. It can help you solve all problems above, and more than that, you can also use it to restore Windows, Access, Outlook, Outlook Express, Firefox, Opera, MSN, Google Talk, Miranda, Paltalk, Trillian and Asterisk password. Something astonishing is original sell it for $54.95, but now only $44.95, nearly 19% off. Really an amazing bet! Bundle in it including Windows Password Recovery, sells alone $29.95, which can help you reset Windows local and domain password on Windows XP/Vista/2003/2008 and Windows server 2003/2008, etc. PDF, Word, Excel, PowerPoint password recovery, which sells $19.95 individually. 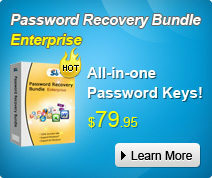 And ZIP, RAR, Internet Explorer, MSN, Firefox, etc password recovery tool, $19.95 respectively, too. It is really a good choice if you are in need of these tools. 1. Windows Password Recovery: Recover Windows local account passwords and domain passwords on Windows XP / VISTA / 7/2008 / 2003 / 2000 etc. 2. Microsoft Office documents password recovery including PDF, Word, Excel, PowerPoint, Access password recovery. 3. ZIP/WinZip, RAR/WinRAR archives password unlocker. 4. Popular Internet Browser like Internet Explorer, Firefox/Firefox Master, Opera/Opera Master passwords recovery. 5. Email like MS Outlook/Outlook Express, MSN password recovery. Now, with this omnipotent tool, your digital life becomes more thrilling. You can get what you want. Never bother about password protected RAR or ZIP game file, just unlock the password and enjoy games as you like. No need of worrying about being blamed by your boss for forgetting Excel files password. Unlocked Windows screen will no longer make you crazy. All things become easier for you! The promotion will end in 15th April, If you are interested, Come on! Don’t hesitate. A bird in the hand is worth two in the bush. where can i buy generic avodart online?